This very modest and unadorned desk is said to have been a gift for William A. Burwell, the young man who served as Jefferson's secretary for the later part of his first term as president. 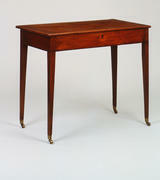 The desk, attributed to the Monticello joinery, has straight, tapering legs, and two hinged surfaces. The first hinged surface exposes a writing surface with a scratch-beaded edge, and the second reveals an area for storage. Dimensions 30 1/2 x 37 x 29 in.